Practice Engineering Chemistry questions and answers for interviews, campus placements, online tests, aptitude tests, quizzes and competitive exams. This set of Engineering Chemistry Multiple Choice Questions & Answers (MCQs) focuses on “R, S- Configuration and Water Softening”. 1. Which of the following is not a priority rule for R, S-Configuration? Explanation: If the four atoms attached to the chiral centre are all different, priority depends on atomic number, with the atom of lower atomic numbers getting lower priority. Explanation: In S-Configuration, our eyes travel in counter clockwise direction from the ligand of highest priority to the ligand of lowest priority. Explanation: The atom of higher atomic numbers gets higher priority. So, –NH2 group has the highest priority of all. Explanation: The process of removal of hardness of water, irrespective of whether it is temporary or permanent is termed as softening of water. This process includes both temporary as well as permanent hardness. Explanation: The external treatments of water include lime-soda, zeolites and ion-exchange processes. It does not include sequestration. 6. Which of the following conditioning method is not used in internal treatment? Explanation: Colloidal, calgon, phosphate and carbonate conditioning method are used in internal treatment. Bicarbonate is not used for this purpose. 7. Select the incorrect statement from the following option. Explanation: Internal treatment is carried out inside the boiler. All the other options are correct. 8. External treatment is a preventive method and it is required in high pressure boilers. Explanation: External treatment is a preventive method and it is required in high pressure boilers. External treatment is carried out outside the boilers. Explanation: Potable water treatment does not involve demineralisation. It involves disinfection, coagulation and sedimentation processes. Explanation: The exhausted anion exchangers can be regenerated by working with alkali solution because alkali solution or basic solution does not contains reactive ions. 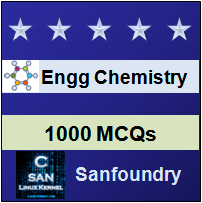 Sanfoundry Global Education & Learning Series – Engineering Chemistry. To practice all areas of Engineering Chemistry, here is complete set of 1000+ Multiple Choice Questions and Answers.